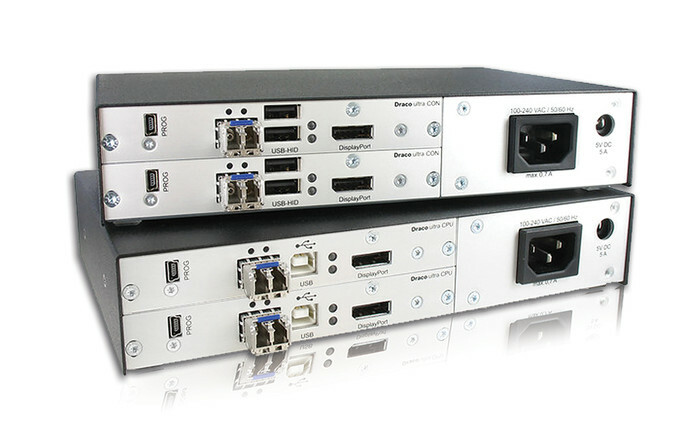 Packaged in a compact 2-slot Draco Vario enclosure are two DisplayPort KVM extenders that create a unique extender solution for business and professional users focused on high-resolution imaging for broadcast applications, command and control, air traffic control, visual medicine, and geospatial mapping. “Whether they’re in a classroom, a boardroom, a military war room or an editing suite — or anywhere in between — organizations are increasingly taking advantage of UHD screens and can achieve more by putting them together,” said Mark Hempel, head of product management for IHSE. “With this Dual-Head 4K DP extender, we’re bringing the next level of dual-screen capability; to increase productivity with large UHD dual-display workstations for ultra-high-resolution imaging, mapping, or multiapplication setups. The Draco ultra DP main module is the first 4K DisplayPort KVM extender with 60 Hz refresh rate in full color depth (Deep Color). The device uses the innovative Lightweight Image (Lici®) codec, developed in cooperation with the Fraunhofer Institute for Integrated Circuits. This revolutionary coding technology ensures brilliant image quality at the highest video resolutions with outstanding color accuracy. The Draco Ultra DP Dual-Head extender kit allows users to operate CPUs from a remotely located workstation over two duplex fiber cables or two Cat X cables. The extender transfers digital video in 4K resolutions at 60 Hz refresh rate and full color depth (10 bit, 4:4:4). Users can either create a stretched desktop of 8192 x 2160 across two displays or run them in clone mode to show the same content on both displays. These extenders can also support digital audio transmission via the DisplayPort interface, eliminating the need for additional audio modules and enabling playback of the audio signal on monitors with integrated loudspeakers. It is also possible to integrate optional Draco vario upgrade modules for additional interfaces, including USB 2.0 and RS232. In addition to extending point-to-point high-resolution images up to 5 kilometers, the DP Dual-Head extenders can be integrated into IHSE’s KVM matrix switches, allowing users to share Dual-Head 4K sources across multiple workstations.